The round headlights are an iconic design of the Jeep, but they are a bit more recessed, allowing for more light to shine on the road. You have about 31 inches more in length than the Wrangler with a bed that's about 400 pounds heavier. There are numerous ways to have fun in the Gladiator as you can remove the doors and the roof to feel the wind in your hair. 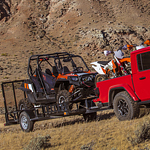 You can easily tow close to 7,000 pounds. There are also various 4x4 commands that allow for driving on almost any kind of terrain. Mullen Motors can offer the proper tires that are needed for driving in almost any condition as well.